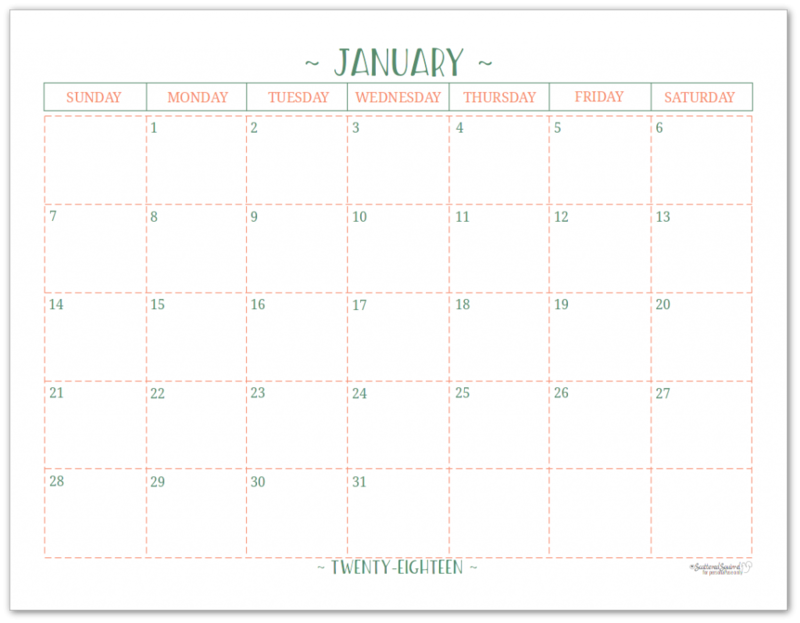 Setting up a new planner for a new year is a simple joy that I treasure every January. Everything feels all fresh and new and it’s the perfect time to get back to basics. 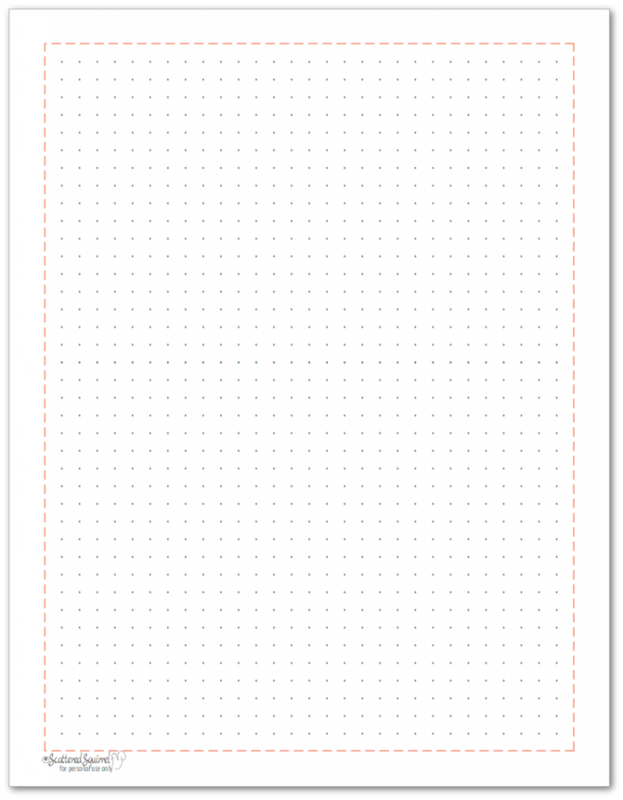 It’s also the time where I update a number of the printables to match the current year’s calendar. Usually I share these a few at a time over the course of a few weeks. This year though, I decided to share them all at once in one massive post. 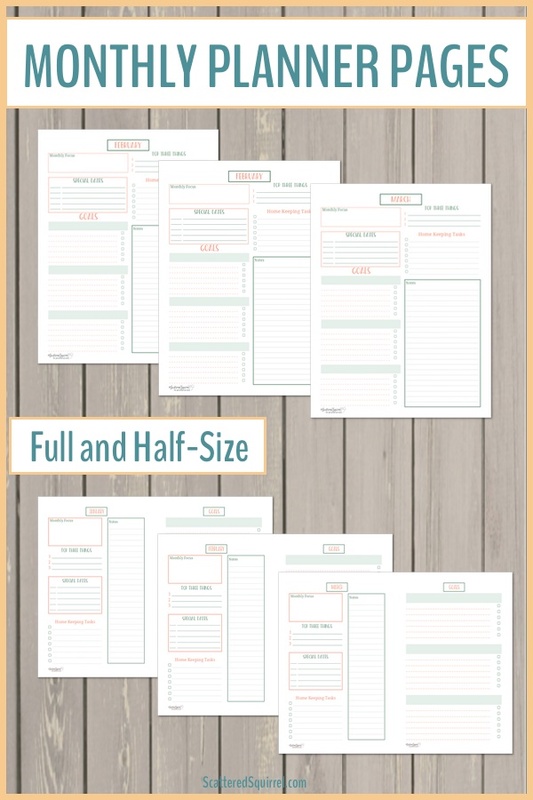 The printables I’m sharing today are what I think of as foundation planner printables. 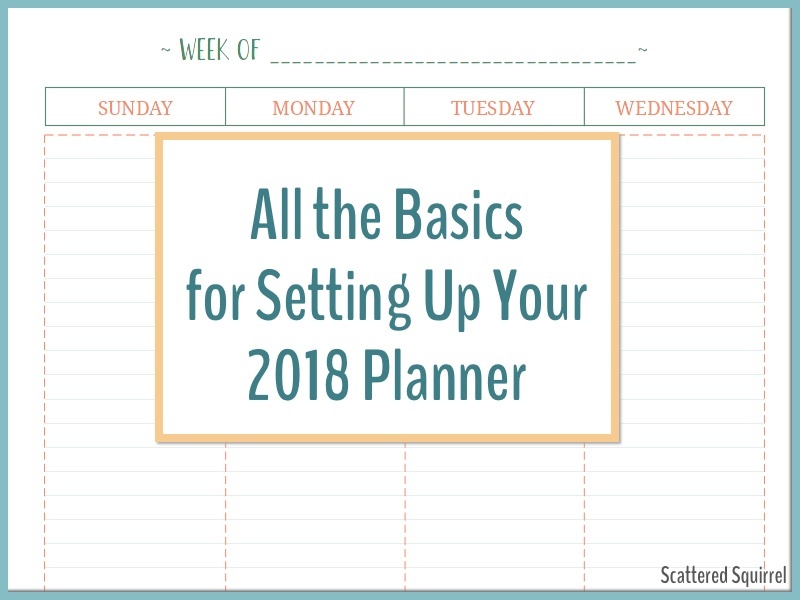 They’re all the basics you need to set up your 2018 Planner. The wonderful thing about planners, especially DIY planners, is that they can be used in so many different ways for so many different reasons. You can make them as basic or as complex as you need or want. At the start of the new year, one of the things I really like to do is scale my planners back to just the basics. After I’ve cleared them out, I print out the pages I need for at least the first three months of the year, and then I can add back in any sections that worked well for me the previous year. No matter what I add to them later, all my planners start with the printables you’ll find below. Every planner I use has at least one dated calendar in it, even if it’s just the year on a page calendar. Though I shared them earlier last year, I’m including them in this post to make it super easy for you to grab the one (or ones) you need. 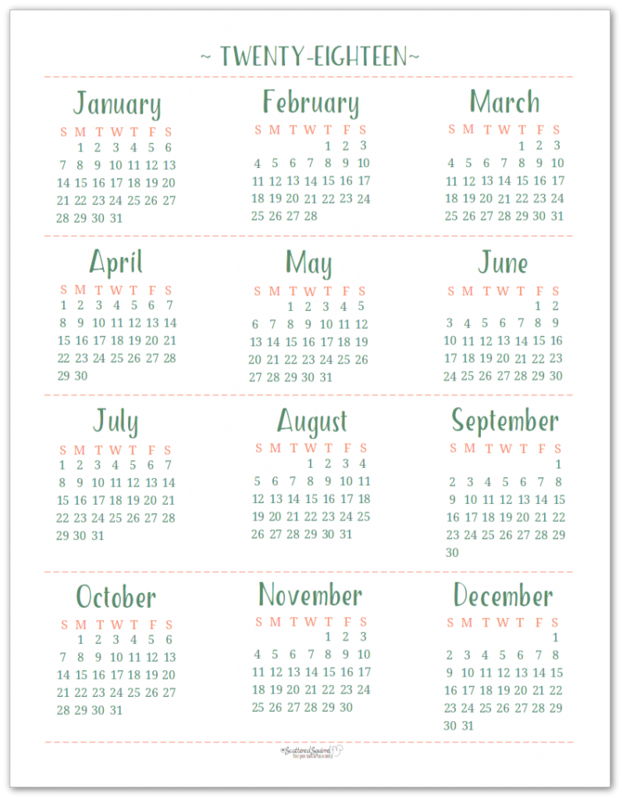 A monthly calendar is a great way to forward plan (plan for events/appointments in the future) and to see an overview of what is going on in your life each month. 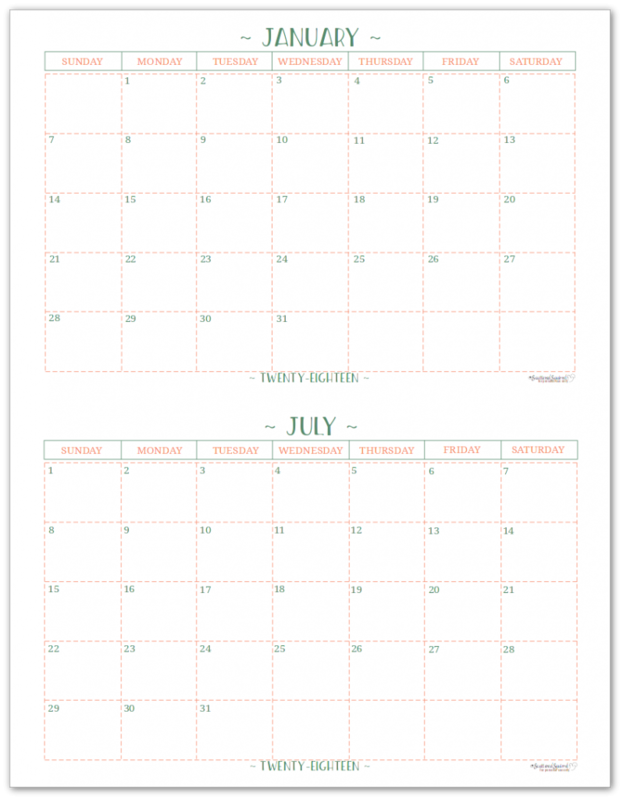 I firmly believe that everyone should use a monthly calendar of some kind, at the very least. It gives you a good foundation, and if you don’t really have to plan too much day by day, it might even be all you need. For more information about the 2018 Calendars check out the posts linked below. 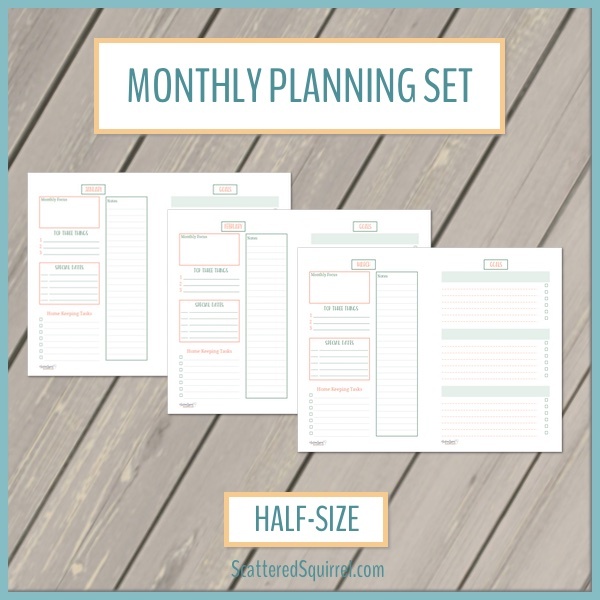 A few years ago I started using a monthly planning page, along with my monthly calendars. 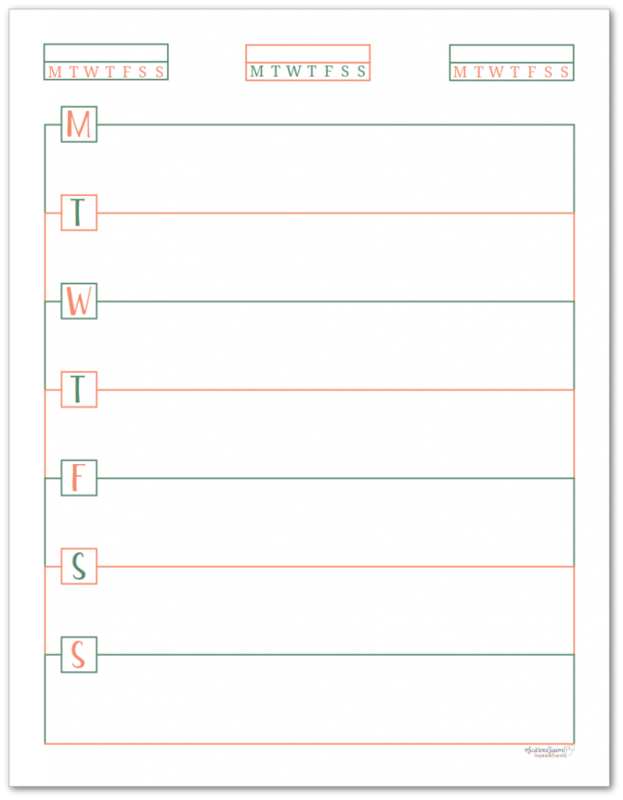 Each month has its own page with space to choose a focus for the month, choose your top three tasks and note any special dates. There’s also a space for housekeeping tasks, this is where I like to note any seasonal tasks that need my attention. I also included a space to plan three goals for the month and a notes section for those little reminders or things that always seem to pop up. I find these monthly pages to be a huge help in keeping my planning focused on what I need and want to do. I refer to them every Sunday when I sit down to plan out my weeks so I can make sure I’m staying on top of things. The next pages I add to all my planners are weekly planning pages. I find having a weekly planner of some sort in my planner to be invaluable. Seeing my week all at once allows me to be intentional with when I plan certain things. 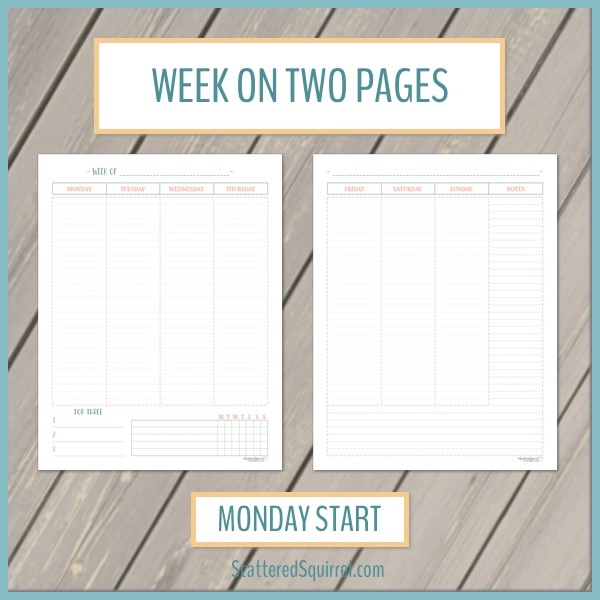 Because weekly planner printables are some of the most popular printables on the site, I made sure to include both a week on two pages and a single page per week version for the 2018 planner. 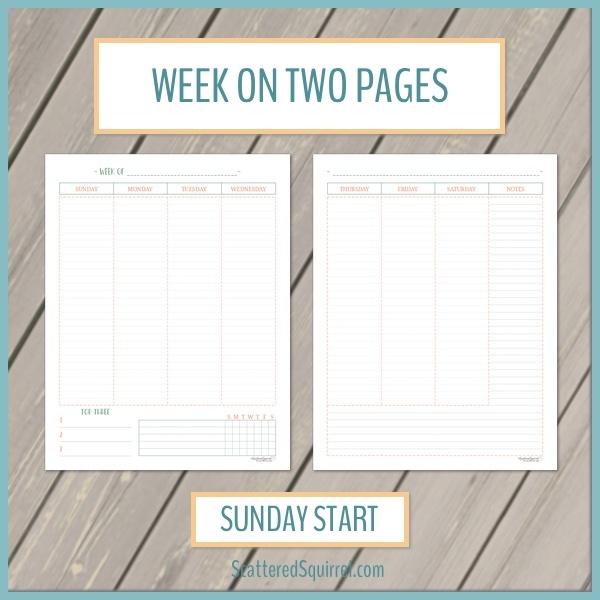 I typically plan my week on Sunday so my weekly planner pages start on Monday, but I’ve received so many requests for Sunday start weekly layouts that I couldn’t resist make two versions of all the weekly planners you’ll find below. These ones are a little different from my old week on two pages layout. I shortened the day columns and moved the top three to the bottom. I added in a habit tracker and made some extra room for the notes section. Both of those last additions were highly requested last year and what better time to try them out than for a new year. I’m using these ones in my work planner to test them out, and so far I’m really liking how they’re working out. I’m currently using this one in my personal or life planner. I printed note pages on the back side so that my weeks are technically two pages. The single page weekly on the left and a notes page on the right. 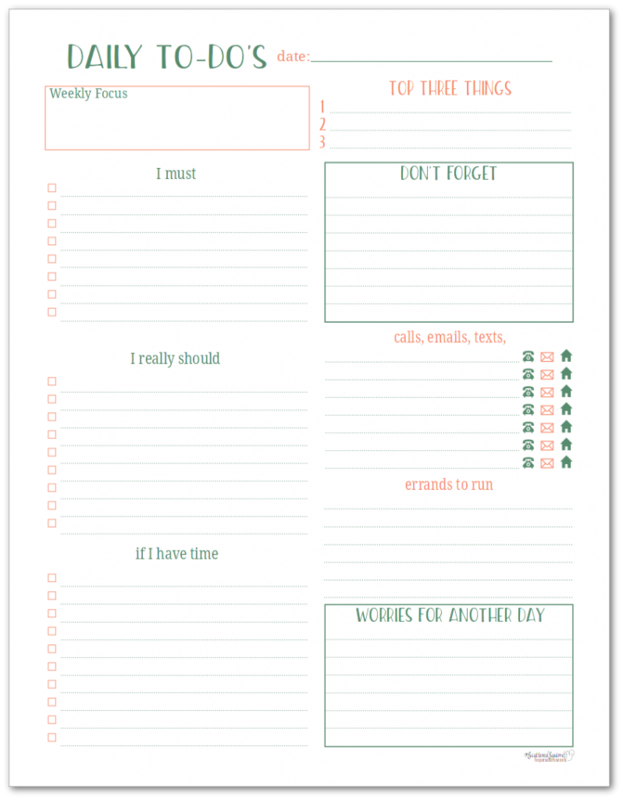 This is the planner where I keep track of everything not work related and it helps to have room to create lists and reminders. 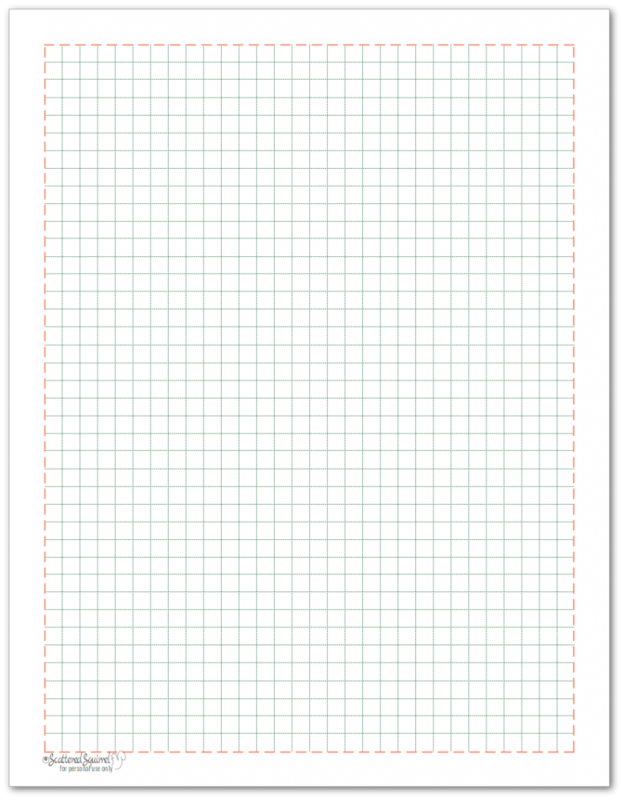 Some weeks I won’t use the notepaper at all, but other weeks it ends up full. 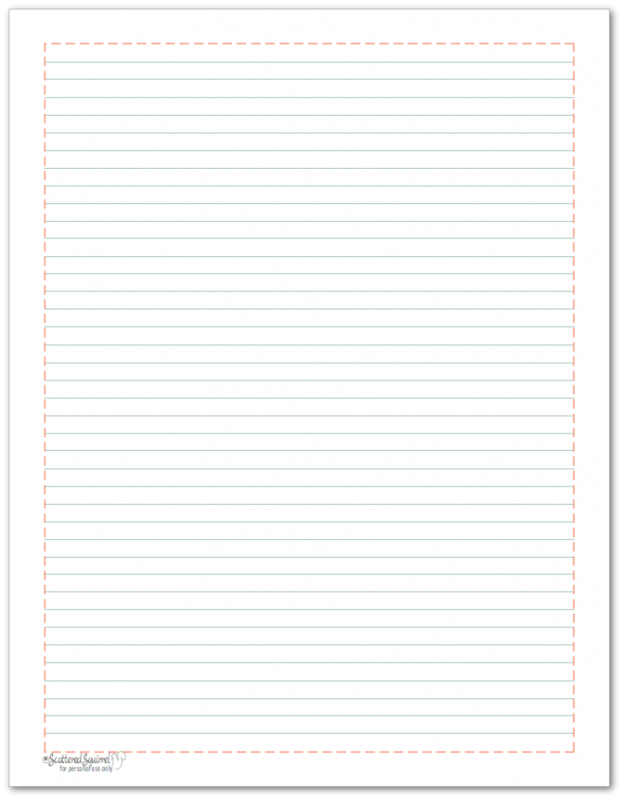 I’ve included three different kinds of note pages as a bonus at the bottom of this post. 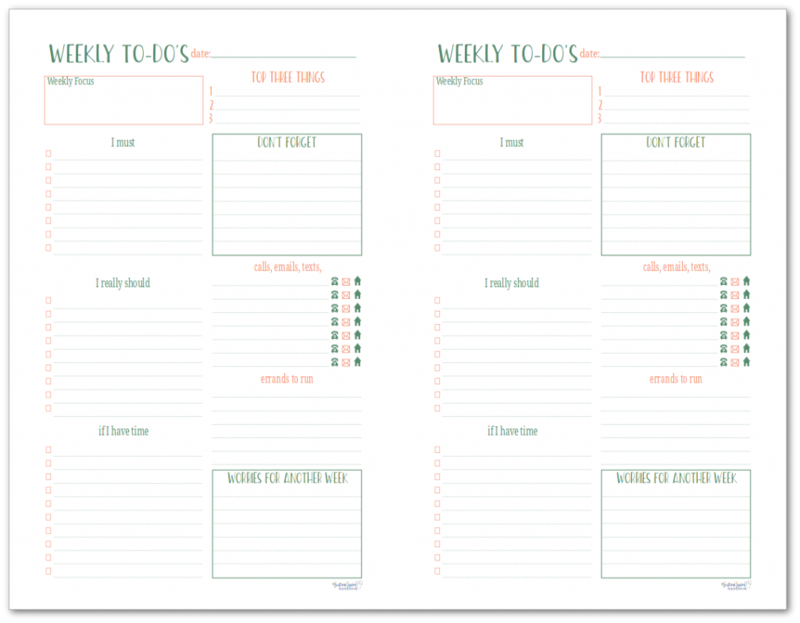 The weekly to-do lists continue to be a popular download so I wanted to make sure that there was a version that matched the 2018 planner colours. 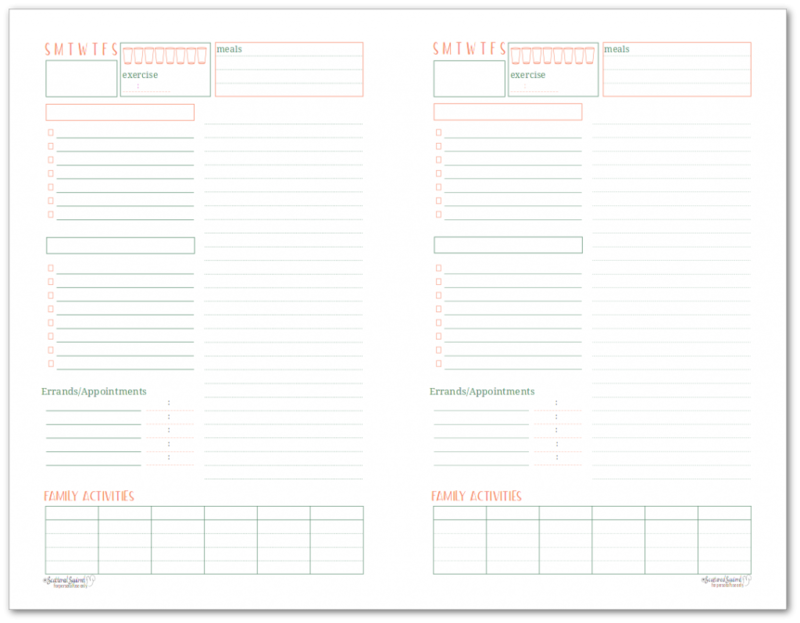 These pages can be really handy for those who need to structure their to-do list a little bit. 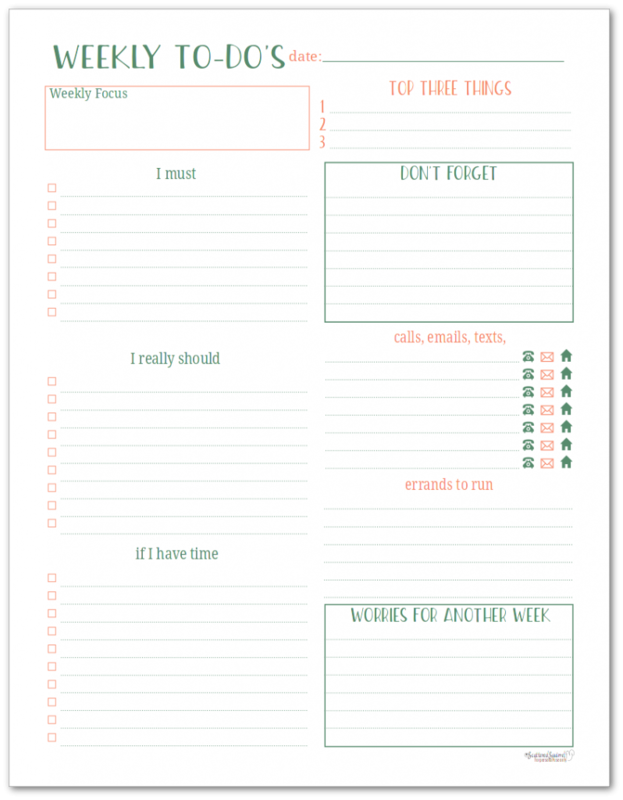 Whenever I have really busy weeks, I pull one of these out from the back of my planner and use it help me figure out what needs to get to done first. Like the monthly planner, I find it helps me plan my week with intention and purpose. 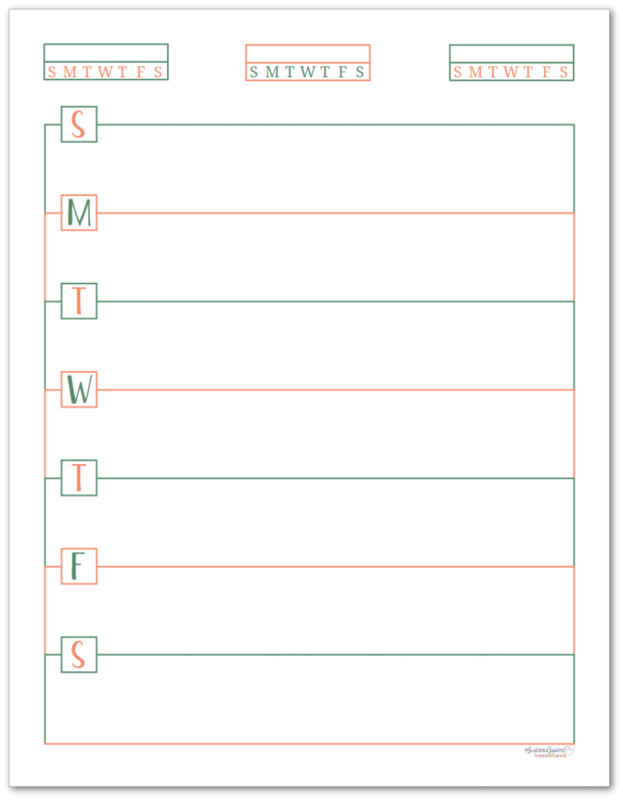 Though not as popular as weekly pages, daily planning pages can be a great addition to any planner. Even if you don’t use or need a day per page, you can keep a few on hand for those super busy days. 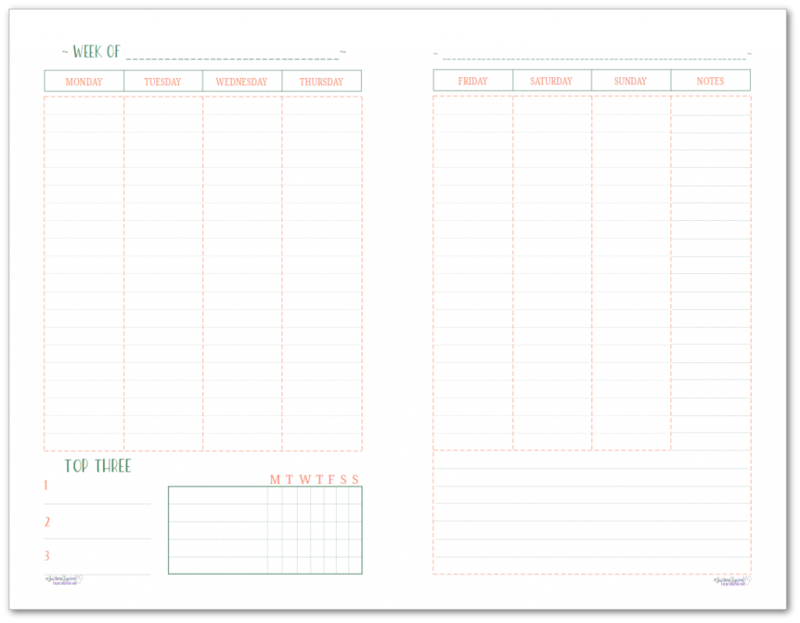 Or, if you’re trying to build a new routine, use daily pages to really map out that routine day by day. I tend to keep a few of these in the back of my planner to pull out when I need them. 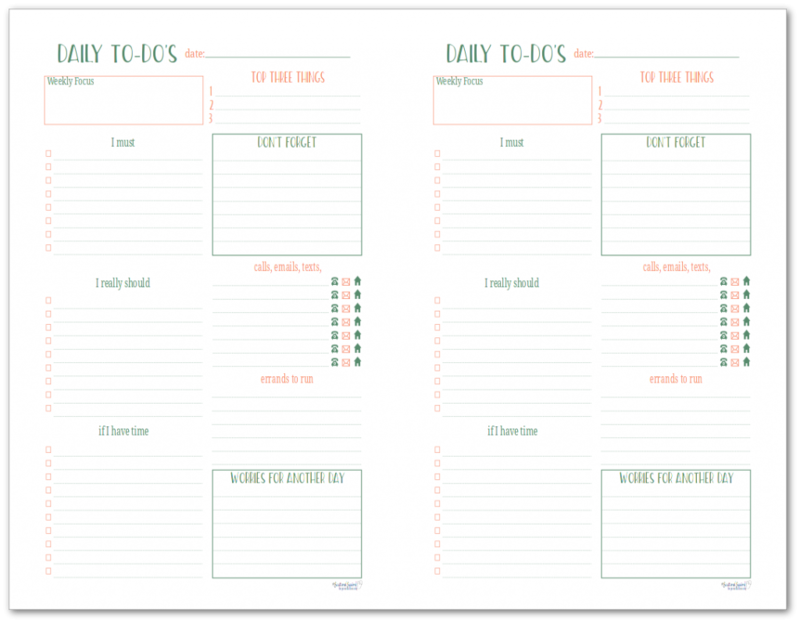 I chose to update the two most popular daily planning pages, but if you need a different one, please let me know. I can certainly update a few more. 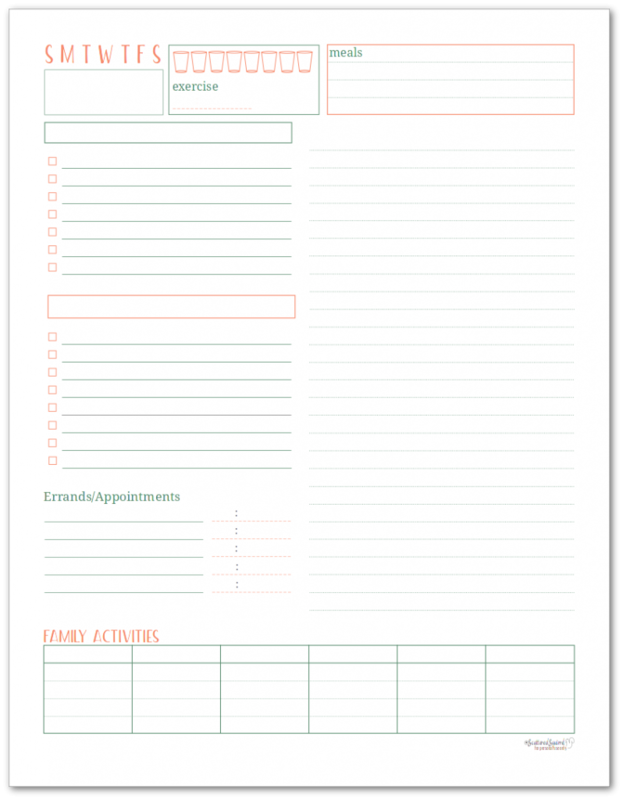 If you used the older version of this printable, you might notice I replaced the labelled checklists with empty boxes. Everyone has their own way of using these sections, and having them labelled was restrictive. This way you can change up what you use those two sections for each day. I like to keep a few of these in the back of my planner for super busy days. I tend to use the right-hand note section as a place to schedule things in by the hour. I just write the times down the side. The family activities section has come in really handy with homeschool and super busy days where everyone is doing something different. Just like the weekly to-do’s these daily ones can come in really handy. You might not need one every day, but on days when you’re feeling overwhelmed, they can really help clarify what your priorities are. I tend to keep a few of these in the back of my planner too, just in case they’re needed. I would say that I use these more than I use the other daily pages, as I find myself reaching for them for work as well as for life in general. I truly believe that all planners need note paper of some kind in them. You never know when you’re going to need to write down an idea, a reminder, or even a note to someone. They’re great for tucking into your weeks if there is information you need to remember that week. They’re also handy for when you’re stuck in a waiting room and need something to occupy the kiddos, or just feel like doodling. I probably print more note paper in a year than I do planner pages. That’s why, for the 2018 planner, I made sure to make three different styled pages to match the colours. 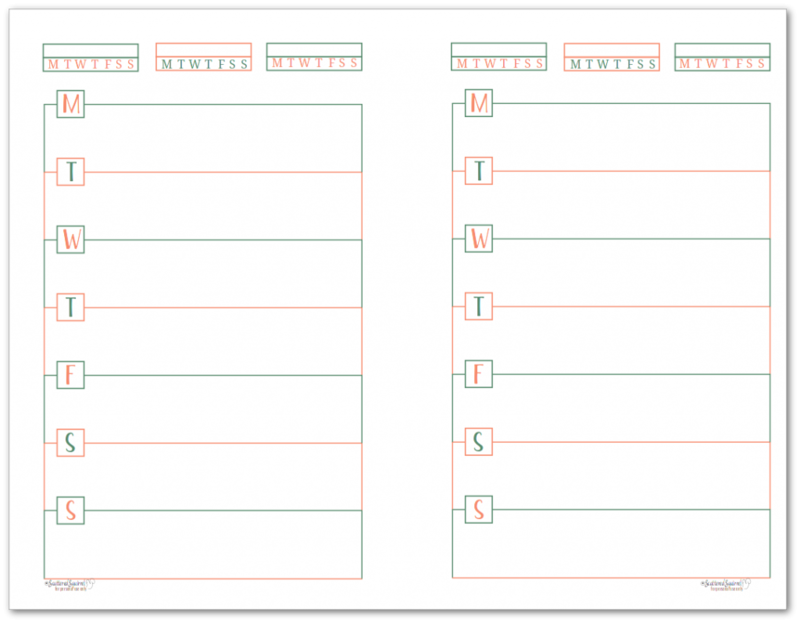 As always, to grab a copy of any of the printables seen in this post or on the site, click the picture of the ones you would like. The PDF will open or a dialogue box will open, depending on the settings of your web browser. Though the printables I included in this post are the ones I consider to be the basics or the foundations of a planning system, I’m always open to suggestions and ideas. If there is a printable you would like to see updated to match the other 2018 planner printables, please drop me a line in the comments below, email or get in touch via Facebook or Instagram. I’ll make sure to add it to the list of ones to have ready for the next post. I’d love to hear what you’re using for a planning system this year! 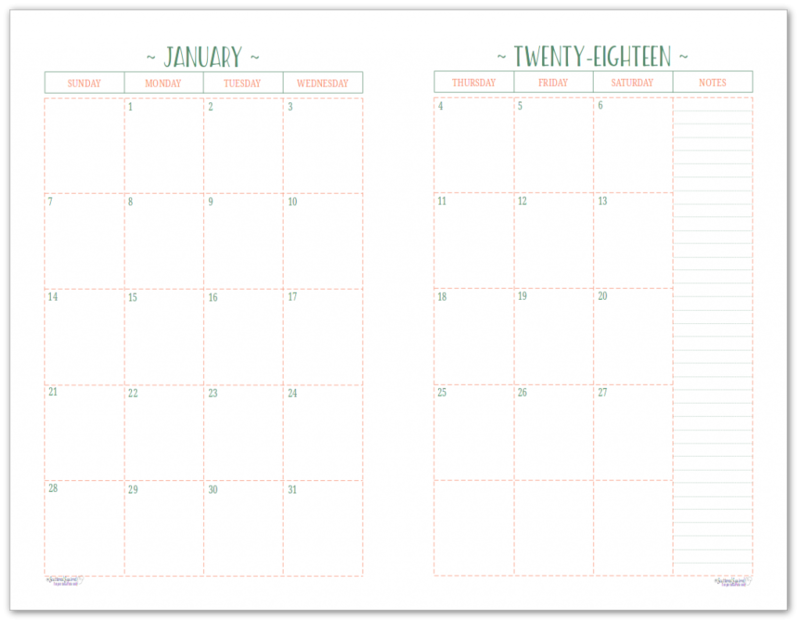 Do you DIY your planner each year? 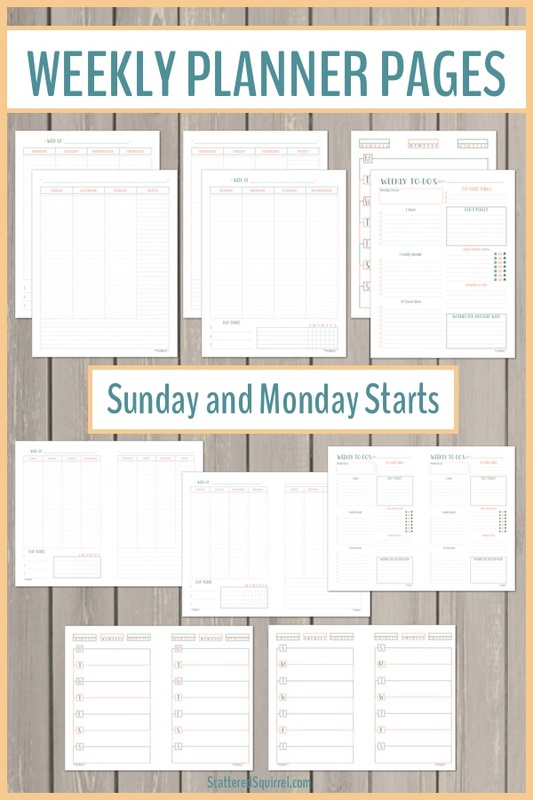 Do you use printables to supplement a store-bought planner? Or are you using something else? Drop me a line in the comments below and let me know. I want to work on organization and meal planning. I have a to do list app but I have been rescheduling items because I don’t want to deal with it today. Organization and meal planning are topping my list of things I want to work on too! 🙂 I hope that you find a few printables to help out. 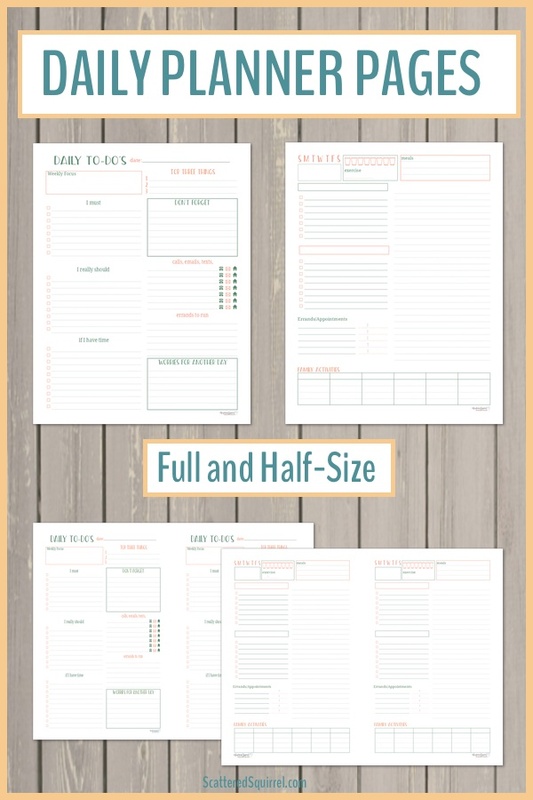 Would you like me to add in a meal planner to the next round of 2018 planner printables? Yes! 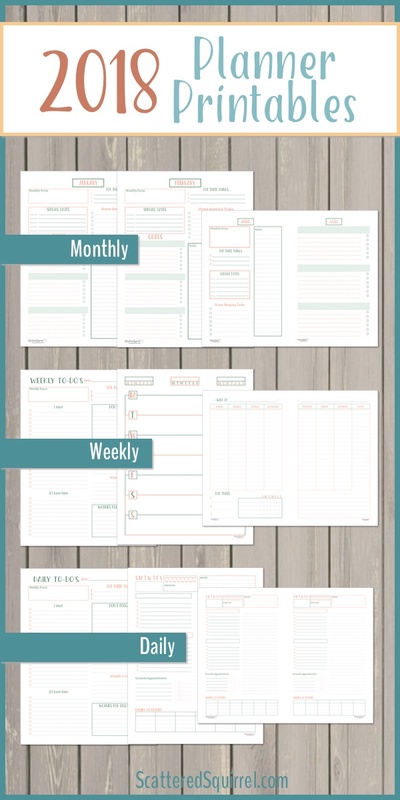 I’d love a meal planner page! All of your planner pages are so helpful and well thought out. 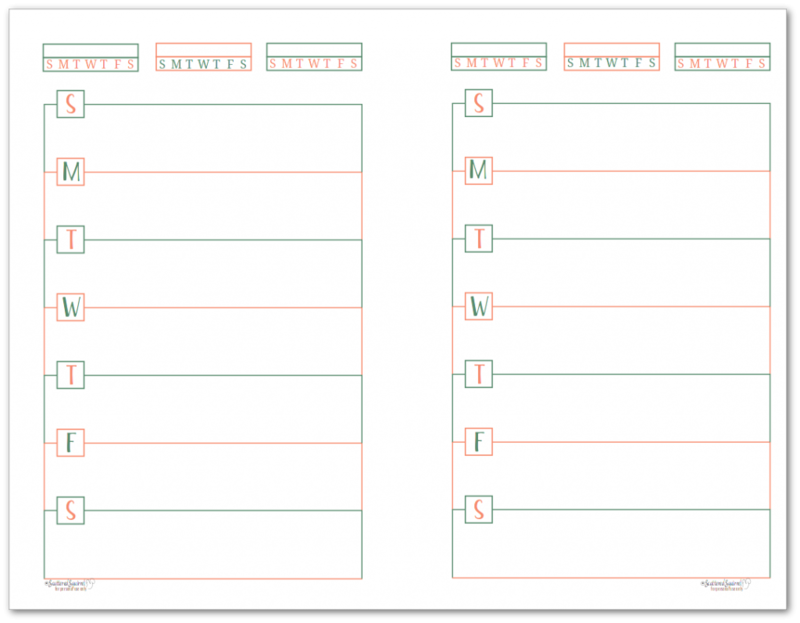 I use them in conjunction with a store bought planner. For some reason when I click on the half page monthly I can’t download anything but no biggie we will just do monthly calendar and weekly pages. For some reason when I click on the half page monthly I can’t download anything but no biggie we will just do monthly calendar and weekly pages. Now I’m off to print all that we need. Hi Shannon, that’s my fault. The links stopped working and I didn’t notice right away. I am so sorry. They’re all fixed now. I love and use your planners annually. However I do also use a mouse pad weekly planner that is always on my desktop and would be lost without it. That is an idea…I clip mine together with a gold binder clip at the top left corner and just put the week used on the bottom so I have it at my fingertips. Thank you so much for all you do to help keep us organized! Happy New 2018!!! I really love your weekly on two pages! Is there any possibility you’re going to publish the yearly and monthly overviews starting with monday too? I recently picked up a gardenpath refill set and I do not like it. That’s always a disappointment when we pick up something we think will be just what we need, only to find out it doesn’t work or we don’t like it. I hope you find something you like better. 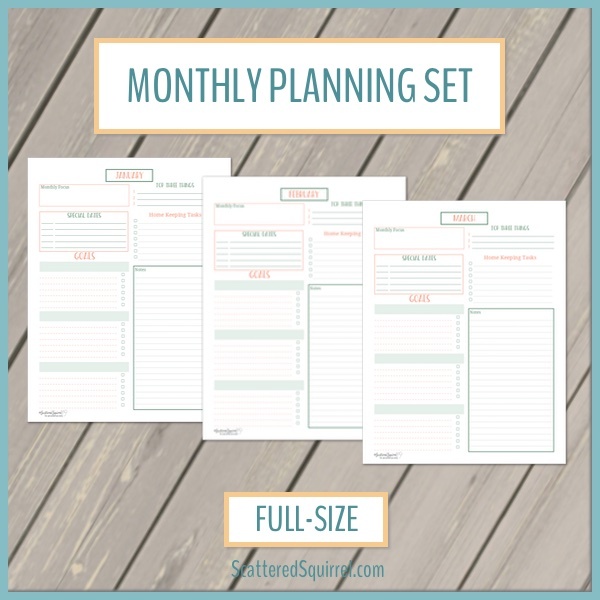 I’m so happy that you found some printables to use for your planner. It sounds like a wonderful mix of practical and fun. That’s one of the reasons I love making my own planners, they can be customized and tailored to fit our needs and personalities. I hope you have a wonderful new year. I think I know which one you’re talking about. I’ll add it to my list. 🙂 They’ll be coming out this coming weekend, now that my computer is fixed. I love the new print for 2018, but I was curious if you had a cover page for the new color scheme? Perhaps I overlooked it. Thanks for the resources. Hi Mary, I haven’t had a chance to make a cover page yet. I wanted to have a bunch of things done for the new year, cover pages/divider pages were on my list, but the car accident kind of kiboshed those plans. They are on my list though. Look for them to come out before the end of February. Thank you for creating these! I made my own binder planner. You have the best planner pages ever! I just love them! You are helping me get organized! Thank you so much the kind words Thia. 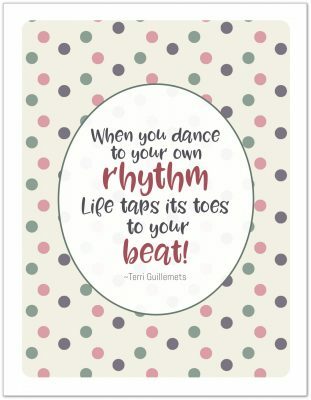 I’m thrilled that you like the printables. I hope they come in handy for you. I have been addicted to stationary and planners for as long as I can remember but nothing that I bought ever worked consistently & would be abandoned usually by June. I have been using your planners for four years or so and I love them! I usually just need a year of monthly pages in the half size. I print them double sided on card stock and washi tape the edge. But about 4 times a year I have an especially busy schedule and print out a couple weekly pages to get through it. I love not having to waste the paper because my planner came with so much that I didn’t need. If it is too fat then I won’t carry it around and it becomes useless. I make my own shopping list to keep in there and some lined paper for notes and stuff. I just add your calendar to make it perfect. Thank you! Thank you! Thank you! That’s awesome Cassie! I love how you’ve made your planner work for you and not filled it with things you won’t use. That’s so important for having a system that works for you. 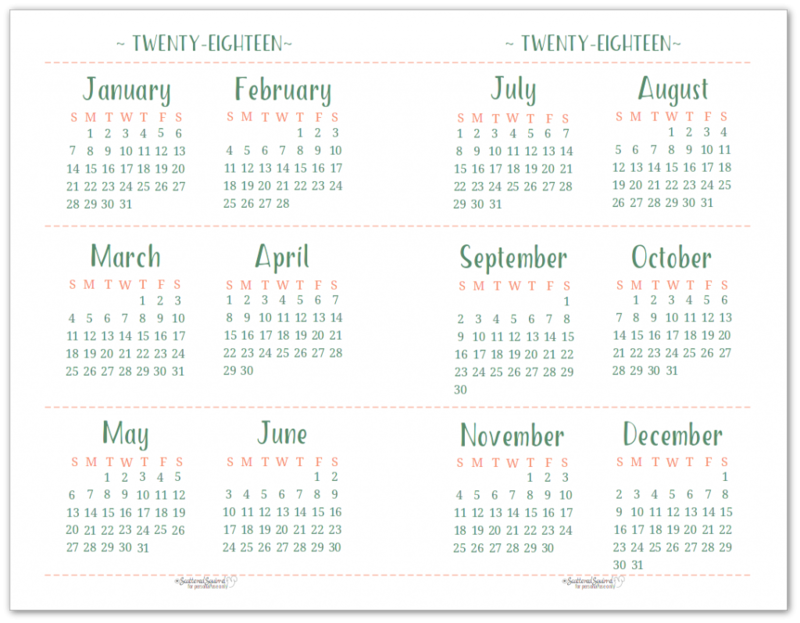 I’m happy that you find the calendar printables so helpful! Hi Charlotte, thank you so much for your kind words. I don’t have a post about that, but you know what, I’m going to add that to the top of my posts to write list, because that’s a great idea. In the mean time, here are some of my tips. 1. Before you start downloading create a folder on your computer for your planner pages. 2. When you download, if you have the option, save the files right to that folder. If not, after you download them all, move them from your Downloads folder to your Planner folder. 3. When printing, especially when trying a new planner system, only print a few months worth of pages. This way, if you need to change things up, you don’t have to worry about having wasted a whole bunch of paper. 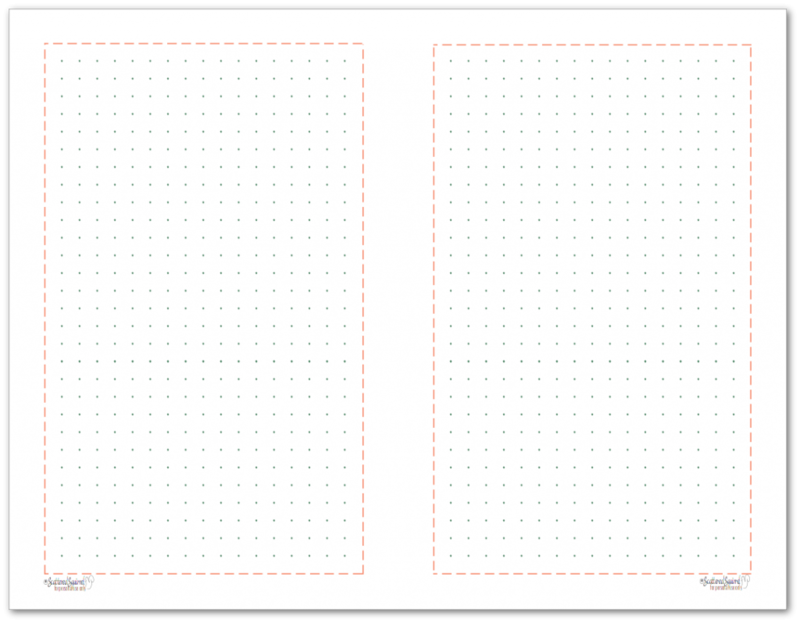 As for the half-size pages, they will fit almost any A5 size planner, the Arc Junior Notebooks from Staples, and you can often find mini binders at Staples, Target, and sometimes Wal-Mart. 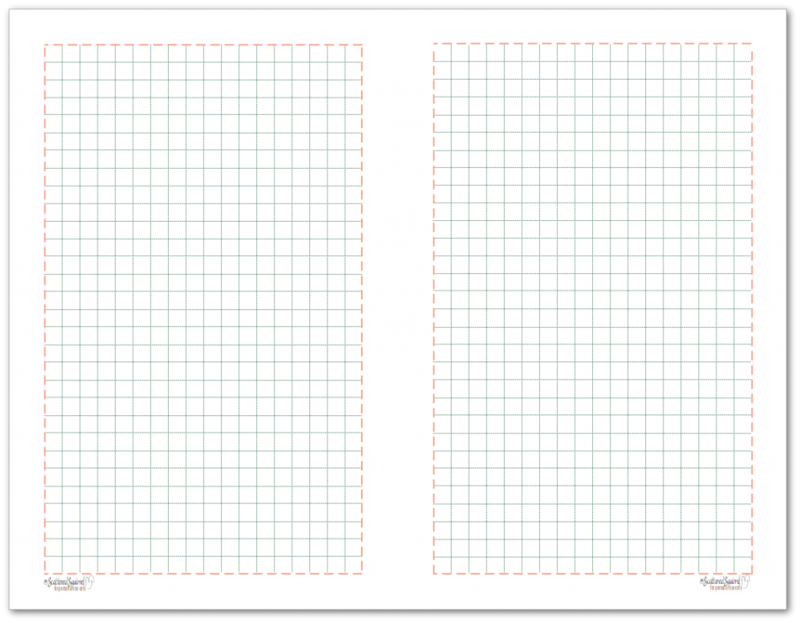 I know that the half-size will fit the Avery Mini-Binders, I’m not sure about other brands. Just double check the measurements before you buy. They should be slightly larger than 5.5 x 8.5 inches. As for hole punches, it depends on what style you go with. Disc bound books require a different punch than rings do. 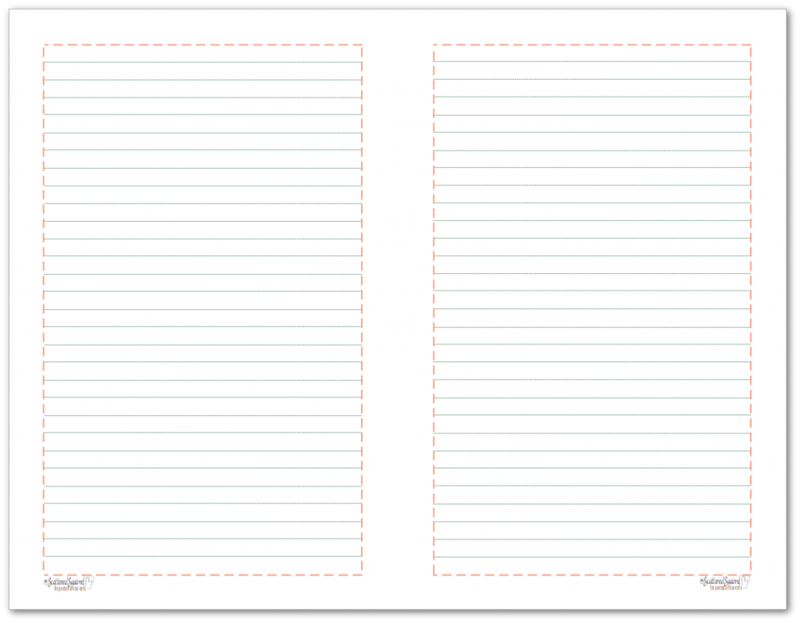 If you opt for a three ring mini binder, look for an adjustable three hole punch that will let you punch smaller paper. 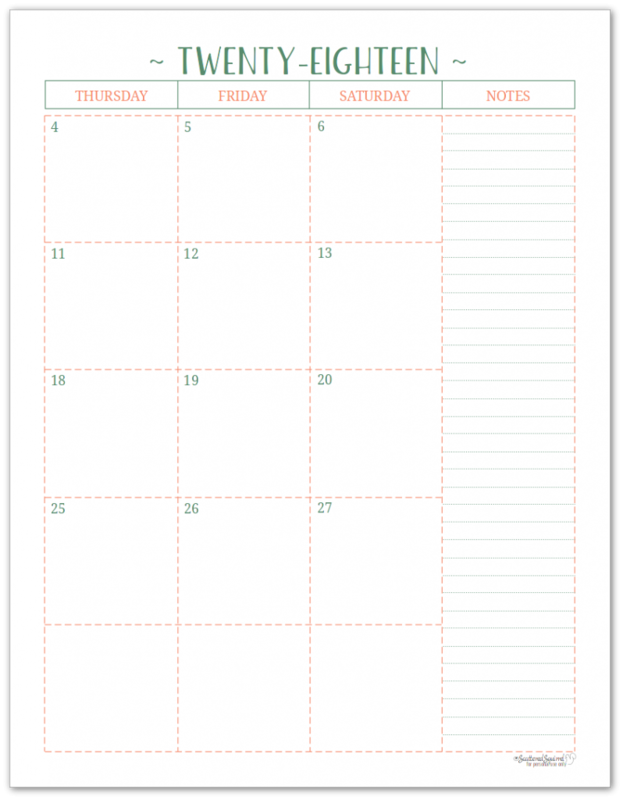 If you opt for a ring A5 planner, you can find A5 hole punches at Michael’s that work well. If you have a coupon then they’re even more affordable. Just make sure to check the ring set up before you buy. Some of the ring planner have two sets of three rings and some have 6-7 rings evenly spaced down the page. I’m not sure where you get a punch for those ones, but I’m sure you could find one on Amazon. I hope this was enough help to get you started. I’m going to start working on that post as soon as I can. And for one last tip – have fun with it! Planners may be tools, but having fun with the planning process and the set up process can go a long way towards making it something we stick with. I can’t tell you how amazing these look. I teach soft skills in a college and these will benefit my students so much (and myself!!). Thank you for allowing us to be able to us these. That’s fantastic Nicole! I’m happy you found some of the printables to be useful, not just for yourself, but for your students too. Please could you remove the apostrophe from dos. It means that people who are grammar obsessed like me cannot use them and I printed a whole lot without looking. My fault I knowbut it would help.